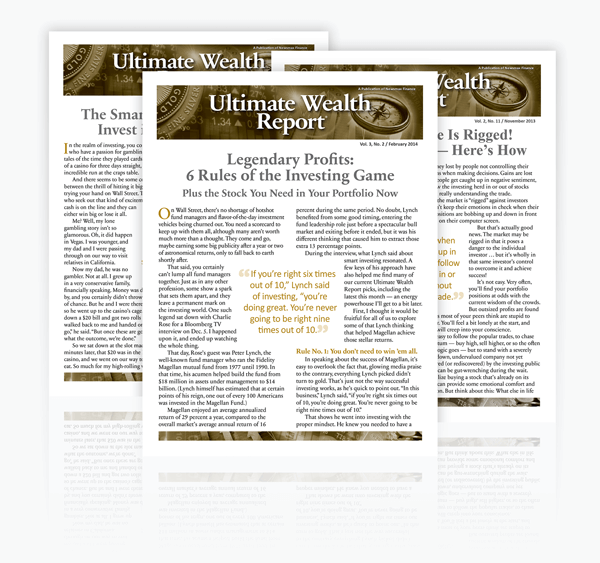 You started the first step by joining the Ultimate Wealth Report. Congratulations! Any of the securities listed (stocks and options) can be purchased through a broker — online or by phone. The stock you recommend is above your “buy” price. What do I do? We believe the best thing to do is wait until the price drops down to our recommended “buy” price. What you ultimately do is up to you. Ultimate Wealth Report made a recommendation on a particular stock/option and I need more information about the company. Where do I find it? We always conduct a detailed evaluation of each recommendation. The website is filled with current and past recommendations which have the information you are looking for. If you look for the date we acquired a stock/option in the portfolio, chances are you can look at the prior recommendation to get the full story. Otherwise, there are plenty of websites available to do research on the stocks/options we recommend. The easiest thing to do is just “google” it. Go to www.google.com and do a search on the stock.